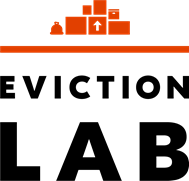 Princeton University launched a new database, Eviction Lab (evictionlab.org), which highlights alarming rates of individuals and families that are housing unstable due to evictions across the country. 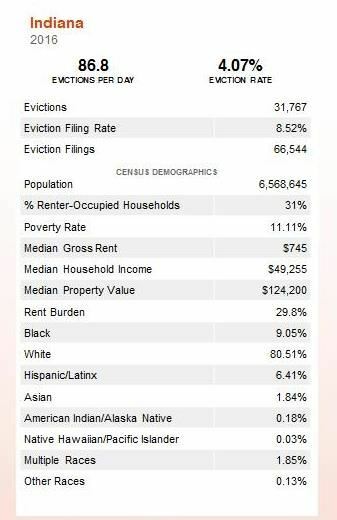 From the collection of 83 million records, the Lab has found that 2.3 million evictions were filed in 2016. The Lab results show that three Indiana cities rank in the top 20 large city of eviction filings in the United States for 2016, the latest data available. 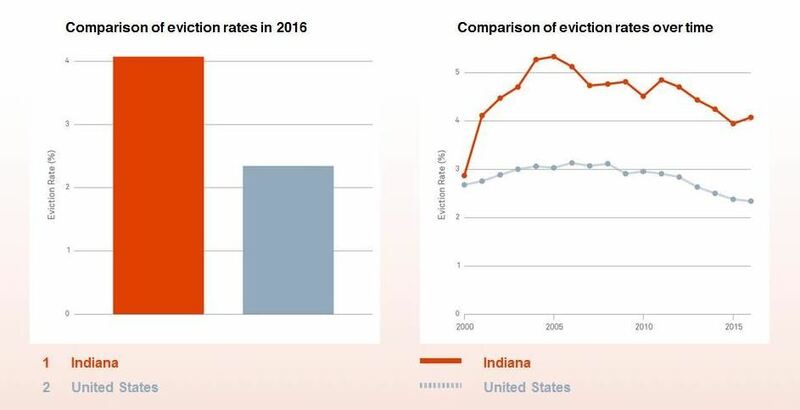 According to the data, Indianapolis had 11,570 evictions in 2016, which amounts to 31.7 households evicted every day and 7.27 in 100 renter homes evicted over the year. Further, data shows Indiana's eviction rate of 4.07% in 2016 is 1.73% higher than the national average. (See end of post for Indiana eviction ratings by city size). The Lab is led by Sociologist Matthew Desmond, author of Evicted: Poverty and Profit in the American City, who cites roughly 20 years of flat income levels while housing costs have increased as a primary source of these issues. Desmond, speaking to Terry Gross, discussed the effects eviction has on individuals, “Eviction comes with a mark that goes on your record, and that can bar you from moving into a good house in a safe neighborhood, but could also prevent you from moving into public housing, because we often count that as a mark against your application. So we push families who get evicted into slum housing and dangerous neighborhoods.” He goes on to say that they have studies linking eviction to job loss due to stress and the mental and physical health impacts related to the event. a cause of poverty," Desmond says in the interview. "Eviction is a direct cause of homelessness, but it also is a cause of residential instability, school instability [and] community instability." The AARP Community Challenge funds projects that build momentum for local change to improve livability for all residents. In 2017, the AARP Community Challenge awarded 88 grants. These grants support actions that can spark longer-term progress. Grants can range from several hundred dollars for small, short-term activities to several thousand for larger projects. Community Challenge grants can be used to create vibrant public places, physical improvement in the community or innovative programming or services. View last year's winning examples here. The program is open to nonprofits, government entities, and other types of organizations, considered on a case-by-case basis. Applications must be submitted online by May 16 at 5 p.m. (ET). Lots of resources and guides are available to walk you through the application process. Visit this website to learn more. The Indiana Office of Community and Rural Affairs (OCRA) has announced that the Quick Impact Placebased Grant Program (QuIP), a matching grant program designed to fund placemaking and transformational projects that spark community-wide conversations and creativity, is open for applications. The project funding range is $2,500 to $5,000 and for every dollar in grant funds utilized, 50 cents must be matched, via cash or in-kind, by the applicant. Eligible applicants can include community or civic organizations, local units of government, or schools. unique signage or identifiers, excluding standard electric signage or non-unique gateway signage. The Office of Community and Rural Affairs encourages these projects to be unique to each community and locally inspired. Successful applications will demonstrate community collaboration, partnership capacity and meaningful community benefits. An informational video will be released on Wednesday, April 25 that further explains the program and application process. Digital applications must be received by 4 p.m., Friday, June 1, 2018 to info@ocra.in.gov. Applications received after 4 p.m., or paper copies will not be accepted. For more information, visit in.gov/ocra/quipgrant.htm. 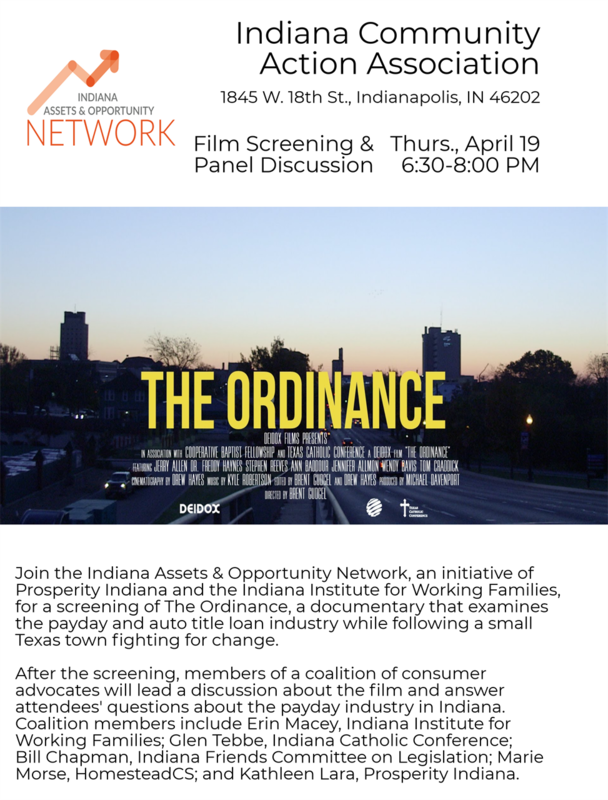 Please click here to join us this Thursday, April 19, from 6:30-8:00 p.m. EST at the Indiana Community Action Association for a screening of The Ordinance, a documentary that examines the payday and auto title industry while following a small Texas town fighting for change. After the screening, members of a coalition of consumer advocates will lead a discussion about the film and answer attendees' questions about the payday industry in Indiana. This event is being hosted by the Indiana Assets & Opportunity Network, which creates learning opportunities for community leaders, advocates on policies that affect low-to-moderate income families, and builds capacity for organizations aimed to increase financial stability. It is co-led by Prosperity Indiana and the Indiana Institute for Working Families. Register here in order to receive email updates about the event. Please download and share this flyer with colleagues who might be interested in joining! Anderson’s Sweet 16 group, comprised of 17 community leaders in five groups, has spent the last 18 months working on a plan to revitalize the 46016 ZIP code. The group presented their plan at the “For the Love of Neighborhoods” event on Saturday, April 7. They introduced their goals for transportation and infrastructure, housing, health and safety, business development, and education and job training. Click here to read the full article and learn about the plan’s goals. Regional Member Meetings are Underway! Prosperity Indiana works to connect its members – to resources and to one another. 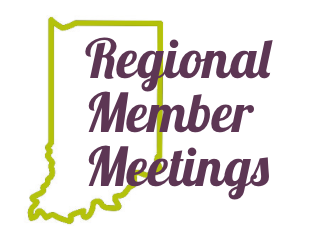 One of the best ways to connect with Prosperity Indiana and other members in the network is to attend a Regional Member Meeting. Regional Member Meetings will be held at multiple locations across the state. Join us at a meeting near you to network with community development peers, share ideas, get the latest updates on what Prosperity Indiana is doing for you, and let us know how we can do better! The first regional member meeting is coming up on April 17, 2018 in Evansville. Meetings in the Northeast, Southeast, South Central, and Northwest regions will follow in the coming months. We encourage you to attend and engage to ensure you are getting the most out of your Prosperity Indiana membership! INDIANAPOLIS, March 29, 2018 – Local Initiatives Support Corporation (LISC) Indianapolis Executive Director William (Bill) Taft was recently promoted to Senior Vice-President for Economic Development for LISC National. His role will include leading the expansion of LISC’s economic and workforce development efforts nationally. A search committee has been formed led by members of the LISC Indianapolis Local Advisory Board to conduct an internal and external search to fill this role. Taft will remain Executive Director of the Indianapolis office until a new director is named. Since becoming a national LISC Program Vice-President in 2014, Taft had also overseen programs in Chicago, Minneapolis-St. Paul, and Duluth Minnesota, and has led efforts to expand LISC’s economic development efforts nationally. In this new role, he will continue to work from the Indianapolis office and be engaged in expanding economic development work locally, as well as across the country. Taft was hired as the Indianapolis Executive Director for LISC in 2005. Since its inception in 1992, LISC Indianapolis has invested more than $260 Million to leverage almost $958 Million dollars of investment in the core urban neighborhoods of Indianapolis. These investments in comprehensive community development include affordable housing, small businesses, community facilities, charter schools, commercial corridor revitalization, and green spaces. These occurred through LISC leadership in the Great Indy Neighborhoods Initiative, Fostering Commercial Urban Strategies, Centers for Working Families, and Great Places 2020. He served as the president of Southeast Neighborhood Development, Inc. (SEND) from 1991-2005. Under his leadership SEND invested more than $35 Million into the early phases of revitalizing the Fountain Square Area of Indianapolis, created its cultural district, founded the SENSE Charter School, and formed partnerships with the University of Indianapolis. Before SEND, Bill was the Executive Director of Main Street Richmond, and he also served with the Pennsylvania Avenue Development Corporation, Senator Richard Lugar, and the National Park Service. For those interested in applying for the open position of Executive Director of LISC Indianapolis, please visit: https://www.linkedin.com/jobs/view/603502640/. The role provides the strategic direction and guidance for all aspects of LISC’s program in Indianapolis. The Executive Director is responsible for raising capital and resources locally that are leveraged by National LISC’s support. The position requires a strong commitment to the role of community-based non-profit organizations as agents of positive community change as well as an understanding of and appreciation for other key public and private partners who can offer additional resources to the work of community development in Indianapolis. Prosperity Indiana is pleased to release the following service site application to place eight (8) quarter-time Members in nonprofit organizations or local governments this summer. Members will serve 450 hours (approximately 40 hours per week) beginning May 21st through August 10th. The Corporation for National and Community Service (CNCS) pays almost two-thirds of the costs associated with hosting a Member. For more information, please contact: Carey W Craig at (317) 454.8538, or at ccraig@prosperityindiana.org. What is an omnibus bill? Previous to this deal, the government has been funded under a series of continuing resolutions, or CR’s. The difference between a CR and an omnibus agreement is that under a CR, existing programs receive static funding and it is intended to fund programs for a short period of time. With an omnibus bill, the budget bills from each of the Appropriations Committees are combined into one bill and legislators may adjust programs and funding levels as they see fit. Upon passage, this bill will fund programs through the end of FY18 (Sept. 30). Overall, the bill contains nearly $700 billion defense spending and $591 billion for nondefense budgets. The legislation provides a 10% increase for HUD funding overall for this year- $4.6 billion above FY17 levels and significantly higher than any of the budget proposals from Congress or the Administration. The bill also includes key program improvements for the Low Income Housing Tax Credit, Rental Assistance Demonstration program. The bill contains funding to renew all Housing Choice Vouchers and provides new vouchers to veterans and people with disabilities. It provides nearly $1 billion in additional funding to repair and operate public housing, and significantly increases funding for Homeless Assistance Grants, Community Development Block Grants and the HOME Investment Partnerships program (HOME). Additionally, the bill does not the HUD tenant rental increases proposed in the Administration’s budget request. Within Treasury, the bill rejected the Administration’s proposal to eliminate Community Development Financial Institutions (CDFI) Fund grant funds, another critical win for Prosperity Indiana Members. There were some setbacks, such as language pertaining to fair housing rules and a decrease in USDA rental assistance (described below), but overall, this is a package with great wins for our advocacy goals. Please contact Kathleen Lara at klara@prosperityindiana.org with any questions. · Income averaging, on a permanent basis after enactment of this bill, which would allow the 60 percent AMI ceiling to apply to the average of all apartments in a project rather than each individual apartment. That increases the ability of the tax credit to reach the lowest income households. The bill, unfortunately, does not include a fixed 4% rate or some of the other improvements we sought to include, but getting the improvements we did is significant progress. As it stands, the revisions included should help offset the impact of the lowered corporate tax rate which reduces the value of Housing Credits to corporate investors. 1.36 billion (43.4% increase) The highest funding level in seven years! $2.51 billion (5.5% increase) This includes a $2.11 billion set-aside for the CoC and rural housing stability assistance programs, and $270 million for ESG. Under RAD, public housing agencies are able to leverage public and private debt and equity to fix public housing stock. The bill increases the unit authorization cap to 455,000, extends program authorization to 2024, and authorizes RAD conversions of the approximately 120,000 units in Section 202 properties (low-income senior housing) with Project Rental Assistance Contracts (PRAC). Unfortunately, it does not provide any incremental funding to facilitate such conversions. $22.015 billion for tenant-based rental assistance (TBRA) (5.3% increase), $19.6 billion of which is to renew previous contracts. While the bill does not change the budget for HUD’s office of Fair Housing and Equal Opportunity, it does include unhelpful rider language prohibiting HUD from directing local governments to change their zoning laws under the agency’s Affirmatively Furthering Fair Housing (AFFH) rule or with the AFFH assessment tool. Within Treasury, $250 million (.08% increase). This includes $160 million for financial awards and technical assistance as well as $500 million in guarantee authorization level for the CDFI Bond Guarantee program level with FY 2017. 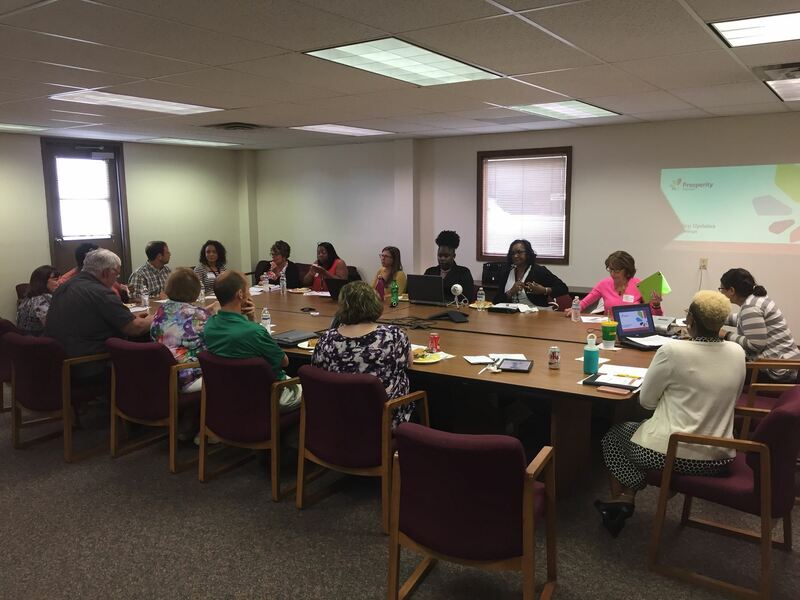 The Indiana Financial Capability Corps (IFCC) is a statewide partnership joining Prosperity Indiana and local nonprofit agencies like Community Action, United Way, development corporations, and others, including local governments. The IFCC utilizes AmeriCorps, a national service program, to bridge the gap between low-wealth residents and available financial capability resources through education and empowerment. IFCC AmeriCorps Members help create economic opportunity focused on the financial well-being for disadvantaged individuals and families. Not only do AmeriCorps Members give back through direct service, they are leading change in the communities and organizations they serve. Members add value to collaborating host sites by bringing their diverse backgrounds to bear in their assignments, leaving an indelible mark on beneficiaries and groups with whom they interact. Host site organizations gain AmeriCorps places the needs of local communities first, strengthens public-private partnerships, build sustainable alliances Use our programs to build stronger, more efficient, and more sustainable community alliances and networks capable of mobilizing resources. Members serve from three months to one year in part- or full-time positions while earning a living allowance and an end of service education award all while gaining valuable professional development and skills. Host sites gain a new generation of leaders focused on putting the needs of local communities first, strengthening public-private partnerships, building stronger, more efficient, and more sustainable community alliances and networks capable of mobilizing volunteers, and assisting rural and economically distressed communities obtain access to public and private resources. The AmeriCorps VISTA mission is to build the capacity of organizations that work to alleviate poverty. For Prosperity Indiana VISTA members, this takes the form of helping the organization better serve its members through managing networks, providing technical assistance, and supporting member communications. Prosperity Indiana is currently recruiting four VISTA positions: two will replace current VISTA members Allegra Maldonado, Assets & Opportunity Network VISTA, and Kaytlin Eastes, Member Capacity Builder VISTA, while two more (Resource Development VISTA and Communications & Events VISTA) will build Prosperity Indiana’s capacity in new ways. Allegra’s work centers on the Indiana Assets & Opportunity Network. The Network was created to increase asset acquisition for low-wealth Hoosiers and strengthen local economies through policy advocacy and capacity building in partnership with organizations and coalitions. Allegra has spent time raising awareness in communities about the negative financial effects of taking out a payday loan and consumer protections that exist to support consumers as they navigate the marketplace of financial products and services. Additionally, she has explored new initiatives to help Hoosiers build wealth, including programs related to retirement savings, the racial wealth gap, and culturally competent approaches to financial coaching. If you, or someone you know, would be a good fit for AmeriCorps VISTA, please review Prosperity Indiana’s VISTA positions listed below. Interested applicants can contact Executive Director Jessica Love (jlove@prosperityindiana.org) for more information. If you have questions about VISTA service in general, contact Kaytlin (keastes@prosperityindiana.org) or Allegra (amaldonado@prosperityindiana.org). Assets & Opportunity Network VISTA – manages the Indiana Assets & Opportunity Network. Capacity Builder & Impact VISTA – provides technical assistance to Prosperity Indiana members on short-term projects. Communications & Events VISTA – leads Prosperity Indiana’s communications, marketing, and event planning efforts. Resource Development VISTA – leverages financial and other support for Prosperity Indiana programs. We Need You to Comment Today to Defend CRA!